It’s a pet peeve of mine. Which means that it has no basis in anything other than my opinion. I believe that in the 80’s classic “Dress for Success”, Mr. Molloy mentions the dark shirt/lighter trouser combination as being appropriate… to casual wear. As I am home with my (still sick) daughter, I am dressed in chinos and a black sweater. Fine. Nothing spectacular, but fine for hanging out at home and running to the pharmacy for more medicine. It is the dark dress shirt to which I object. Not the “French blue” shirt, which — in my opinion — does have a place in the casual wardrobe, rather, it is the maroon, brown, black, charcoal, whatever dress shirt which I cannot stomach. I don’t know the reason for my prejudice. I know that lighter shades of shirts are considered to be more appropriate to business and that finer grades of cotton and linen took to the lighter shades of dye more easily while lesser fabrics required darker dyes to ensure consistency. Maybe that’s it. I hate to think that a perception of “class”… errrr… colours my opinion, but there you have it. They just look cheap. I’ll ask you to resist and lead by example. WWCGD? Most often, a perfectly fitted white shirt. Sometimes fine stripes. Fred Astaire? Ditto, but add tattersall and colourful polo shirts. So, when choosing your shirts, think pale. Yellow, blue, pink, bright white, off-white are all fair game. As long as they are the palest of shades. This entry was posted in Elegantology and tagged Dress shirts. Bookmark the permalink. Dark dress shirting screams cheap fabric. There is a subtlety in paler colorings versus the shouting garishness of the bolder colors that is more attractive. Elegance and subtlety go hand-in-hand. That is so funny!…just the other day i was giving my co-worker a hard time because he was sporting a dark puke-colored shirt similar to that found on Dwight from TV show “The Office”. In my previous job, the retired army colonel who was deputy director of the agency was decidedly old school. He tolerated blue and pale yellow oxford cloth shirts, but drew the line at pink. We never thought to mention anything darker. Of course, it could have been a “cold war generation” associational thing with him. Greetings from Charlotte, NC this week. I agree, nothing screams high schoolie, just bought the shirt/tie boxed set on the Xmas clearance rack at Sears, more than this. I’m not even close to being an expert, but even I know better. Besides, why waste your money on a garment completely devoid of versatility? I recently found your blog and think it is very charming. Like you, I highly dislike dark-colored, long sleeve shirts, even without a tie, but absolutely cannot stand them as part of a suit-and-tie combo! I think it looks incredibly cheap. I agree with Pamela: gangsterish, no matter how you try to rationalize it. Gangster for sure, yet alone polyester shirt and tie special. It just never looks right! Many, many moons ago, when I was in college, the only summer job I could find was working in the menswear department of the local Montgomery Ward. I think that was the birthplace of the dark and/or patterned dress shirt boxed with the matching tie, and I shudder to think of all the innocent quianas that sacrificed their lives to provide the fabric. A young man came in once, looking to acquire some shirts befitting of his new role as assistant manager of a chain restaurant. I tried to steer him toward cotton for its “breatheability” but he insisted on the polyvinyl to better deflect grease stains. I hope they worked out well for him. I must unashamedly admit that I have red, purple and lilac shirts in my wardrobe!! I don’t know if you call these gangsters’ shirts but one tends to get away with bright colours if one is an artist. My art teacher once told me, “Colours don’t clash”. G. Morien-Jones, I do have a very light lilac striped double-cuffed shirt that is wonderful. The darker hues just don’t work with a more formal wardrobe. 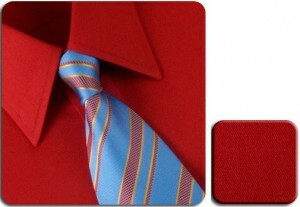 Red stripes, purple stripes (alternating with white) work fine, especially with white collars and cuffs. And yes, there are always concessions for artistic license! I speak in generalities. I’m sure you wear them well. I worked as a designer for a company that sold many a “dark” shirt and I never quite understood the intrigue of the dark shirt, it always looked kinda “gangsta” to me. I need some ideas for an 80’s party this weekend….help. Oh Mrs. PvE! Hook up the TV and show reruns of “Remington Steele” “Ferris Buller’s Day Off” “Risky Business”, “Duran Duran/Adam Ant/Madonna videos or any one of the Brat Pack/Mollie Ringwold/John Cusak movies with the sound turned down. Serve sushi, and nachos. The soundtrack’s a breeze. And don’t forget to remind Mr. PvE to wear his skinny tie and Wayfarers. Above all, have way too much fun and hope that it trickles down. Amen and please may all men listen to you, xv.